Many friends asked where did my sewing skills come from and why I like to sew. Things are easily affordable and accessible in Singapore. In a way, it is not necessary to sew things for ourselves. Well.. I would attribute my love for handmaking to the people with me in my growing up days. When I was a little girl, my mama used to bring me to my grandma’s home and at times I would stay over. My grandma had a sewing corner at the back of her home with her vintage Singer sewing machine and her stash of fabrics around the room. Grandma loves to quilt and give them away to friends and family. Recently, she made one small quilt for Jeanne too. Julian loves it and is using it as Jeanne shares quilt with me and hubby. Next is my mama, she always have clever ways on making things work with rags and scraps she can find at home. Raffia strings and masking tapes are her best friends. There was also a period of time when one of my uncle and his wife stayed at our home. His wife was a shoe maker and works from home. I used to enjoy sitting with her watching her cutting leather pieces and adding accessories to them. Oh I miss that! School days, I joined the Art class and that was the subject I enjoyed most! I was into making cards during those days. I still have my collection with me. It was after Julian’s birth that a close friend introduced me to a world of craft bloggers out there. I begun to surf and was truly inspired by the tons of pretty things that were handmade by them. I told my husband I wanted to learn sewing and he bought me a sewing machine as a gift. I signed myself up for a dressmaking course and from there I got to use my sewing machine more often. Slowly I started to google for tutorials and worked on them and learn the techniques as I go. I am still surfing for tutorials and will share them with you. 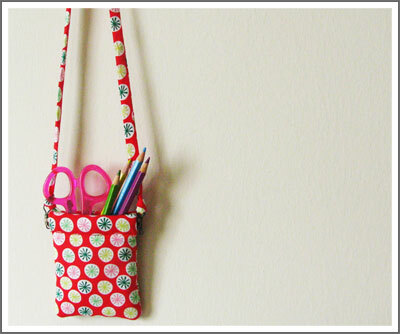 I made this sling pouch for kids to post as the first project on the blog. Gonna make one with a more boy looking fabric for Julian! He can use it to store the seeds and flowers he collect from the field! For this pouch, I used the Flexi [Fabric] Stash Coin Purse Tutorial by Lisa from U Handblog. Lisa specializes in bag making and is an author to The Bag Making Bible. I had not read her book but looks like it would be a great one looking at all the quality of tutorials she had provided on her blog. Go check out her blog if you want to learn bag making! This entry was posted in Craft, Tutorials and tagged Bag Making, Crafts, Handmaking, Kids, Sewing, Sling Pouch on 2 November 2010 by John & Joan.